Donald Trump once famously said that he could “stand in the middle of Fifth Avenue and shoot somebody and not lose any voters,” such was the loyalty of his supporter base. Well, after his recent meeting with Vladimir Putin, even Trump's most ardent supporters might be beginning to think he has overstepped the line after Trump appeared to turn his back on his own intelligence community and align himself with the Russian President instead. Now because this is 2018 not 1968, people's reactions have so far been limited to impotent outrage and of course, memes. Snarky, imaginative and brutally denigrating memes. To be fair we all know of Donald Trump's thin-skinned reactions to being mocked and criticized, so this form of protest may be even more effective than people hitting the streets in their hundreds of thousands. Who knows? And maybe Trump is right, maybe Russia isn't the bad guy after all (when American adventurism is taken into account at least) and constructive dialogue, as opposed to flinging insults and accusations, is the way forward? What do you think? Scroll down below to check out the memes for yourself, and let us know what you think in the comments! Please don't. I like Finland. I started drinking vodka November 9th 2016 and haven’t stopped yet. Oh this one is great! I've seen this photo so many times that I'm chagrined I didn't think of this one myself! Had to stifle a guffaw! Definitely should be higher up.. Just check out the comments on Fox "News"
Please tell me Trump will see these, they are fantastic. The Republicans are more than complicit in Putin's coup. Donald's a blithering idiot but actual politicians should know better. Everyone I have sent this pic to replied “lmao”. EVERYone is a liar (or fake news) except Donald's darling Vlad. Long time ago when our president had balls. #TRE45ON ... now that's clever. Haha! "Respublicans". The Russian pronunciation of the word. Fits, too. Alright the hand movement messed with me on this one. Not sure if it was just the phone loading it or the off timing. But I thought I was losing my mind for a moment. How come my head plays scratching sounds like from the early days of hip hop? Blushing? Can we go with “overly spray tanned”? Love the tape on the tie. Love the classic references in this meme. Live from Russia's Got Talent? I heard he made the finals. 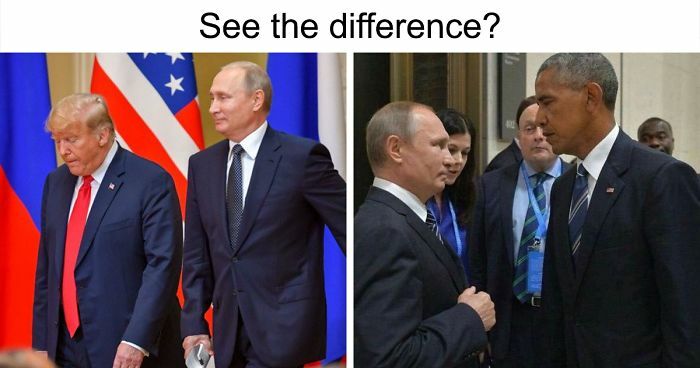 Wait a second... is this a real photo except for Putin's face over somebody else's? The face is so obviously photoshopped but if anything else is, it's much more expertly done... does anyone know the source of this? The man behind the iron curtain. I love it. Wait! Where's the silver platter? Trump wishes his body looked like that. I thought I was okay with breastfeeding in public, but then I saw this. Actual questions that need to be answered. I think that I peed myself a little bit. Orange you glad the electoral college elected ME?! Shouldn't Trump look like a pig instead of a horse in this picture? Hook, line and sinker, for sure! Do not insult that dog! I think this would have been better if left unlabelled. This makes Pennywise even scarier. Putin: "Who is a good boy? Wanna ball, yes you do!" Trump: "A ball!!! A ball!! How awesome! I wouldn't give this to a child. Might scar them for life. Don't insult Walter. Or Jeff Dunham. Do the letters on top of Trump mean anything or not? I noticed V's face changes, and they got the hand sizes perfectly. He should get high marks in his job performance... the way he threw America down the river. This meme is a hot mess in so many ways. Big difference between barebacking and bear-backing. Yeah, and the bloody glove was just “fake news”....riiiight! !